We had a fun Friday at Downbelow’s PADI 5 Star IDC Dive Centre on Gaya island in Kota Kinabalu, because our good friends from Sandakan Politeknik returned for another visit. 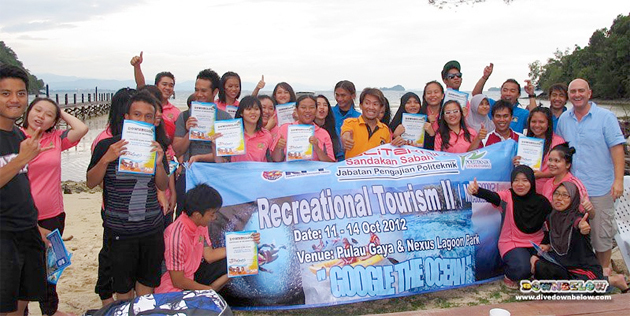 The great bunch of students from the polytechnic visits us regularly as part of their Tourist Management studies. This time around their group of 26 invaded our otherwise serene corner of Gaya island for a day of PADI Discover Scuba Diving programs, plus the ecologically valuable AWARE Coral Reef Conservation course. Downbelow includes environmental components in all group programs, but it’s extra important for Tourism Management students to know that without sustainable practices, tourism attractions may well disappear. Find out more about our Group programs or contact us for a tailored solution to your group activity needs.